One thing I like very much about Paris is that we still have a pretty dynamic movie industry. This is due to specific financial dispositions (for example anybody in France can invest in a movie and get a tax cut), but also to the fact that even if the big American blockbusters are extremely successful, we still have a wide variety of choice when we want to go to the movies. 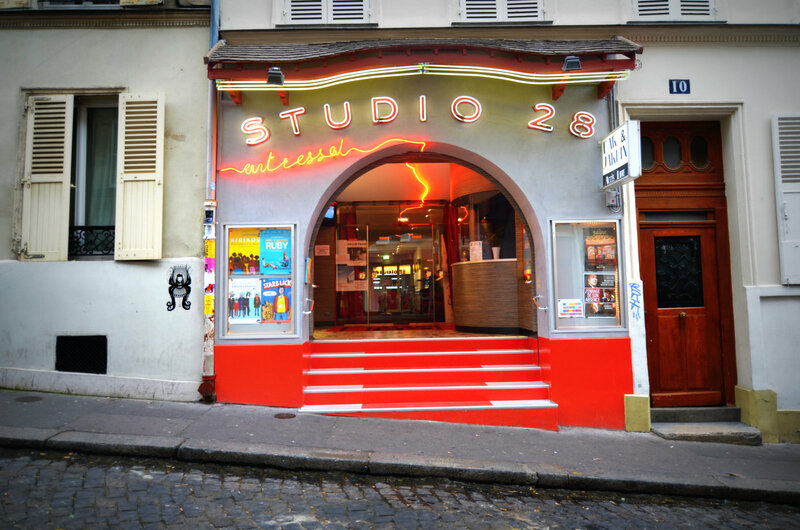 We have what we call Cinémas d'art et d'essai like this one, the Studio 28, located in Montmartre. There you can watch "quality films", the very ones that led Phil in Modern Family to say "Why do I have to watch a French movie, I didn't do anything wrong" -;). Jokes aside, I'm glad these theaters still exist. And what an adorable facade and entrance! A charming place. I love french movies and I try to watch them often. First, for their quality and art (most of them) and second, because they help me to learn french. The color in this picture is beautiful. Looks charming. I think this is what we are missing in American theaters. A movie house that shows one film. Quality over quantity. Phil sounds like my ex—I'm not sure he's forgiven me yet for dragging him to see 'Claire's Knee'! :~} Seriously, you have to be impressed with l'embarras de choix of cinema in Paris. The tax break is brilliant! It is very hard to make a film. One can write and publish a book on one's own, or take photos, but a movie is too big, too expensive. You need a team, and you have to pay them. I wish we had the tax break here. French is the 2nd best Movie Industry in World. French Government is doing very good for investment in french cinema. This American has been watching French films with pleasure since the 1960's. I own several of them and have "Ma nuit chez Maud" practically memorized even though my wife makes fun of me every time I watch it. I love the facade of this theater, it's so bright and I love the bright rouge steps. This place is totally cute. Looks like something Jeunot would have created for one of his films!